More financial burden is on the way in agriculture and rural America with interest rates marching steadily higher. Since 2015, the Federal Reserve has been nudging interest rates higher following years of historically low rates and quantitative easing. Now, with The Fed on a path of rising rates and monetary tightening, rural America will be faced with increased interest expense, which is in addition to other cost burdens, such as higher steel and aluminum prices, higher labor costs, and rising fuel and transportation costs. Higher interest expense will be another burden affecting farmland purchases and operating loans, according to a new report from CoBank’s Knowledge Exchange Division. The largest consideration for the rural economy that will be affected by higher interest rates is the collective balance sheet of the rural economy. 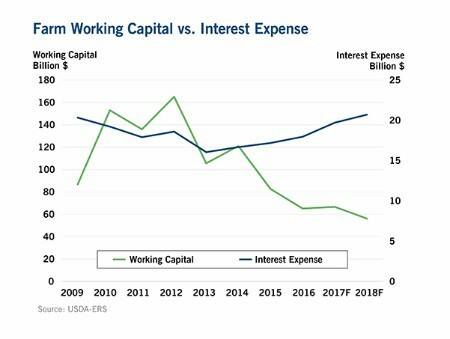 While the current projections indicate rising costs, the collective agricultural industry should have the capacity to service its debt in the near term. However, farmland values and debt vary widely by location and industry. Some industries have been hit harder by lower agricultural commodity prices and will see more pressure than others in a rising interest rate environment. The U.S. Corn Belt and Northern Plains regions, for instance, will experience greater stress than the Pacific and Northwest regions.